If you own your own horse caring for him or her is essential. Grooming, diet, shoeing and hoof care are all areas that need to be given careful attention. Grooming your horse serves two main purposes: it maintains the sleek and shiny appearance of your horse's mane, and improves circulation. A good proportion of your horse's waste matter will be shed through sweat. The pores must be as open as possible for this to take place effectively, which is one reason why horses that predominantly live in stables have their coats clipped. If your horse spends most of its life in a stable, it's best to do the grooming in the morning, as this is when the pores are most open. For horses that live outdoors, intense grooming isn't as important, as it removes the grease from their coat that keeps the worst of the rain off their skin. Start at the top of the ears and work downwards. It's important to stand back from the horse, as you need to be able to distribute your weight behind the brush. Hold the curry brush in your opposite hand, and use this to clean the main brush after every few strokes. The dandy brush should only be used to clean mud off the legs, as it's too stiff to use on the rest of the body. In addition to grooming, you might to use strapping too. This involves hitting the horse's shoulders and neck with a pad to boost circulation and improve muscle tone. Evening is the ideal time to do this, as it will improve circulation overnight. Wild horses won't expend half as much energy as their domesticated counterparts, as they aren't required to do so much running, jumping and galloping. For this reason, it's important to make sure that your horse is fed foods that will replace the lost energy. Vitamins and minerals are a key part of this. There are a few basic diet rules. Firstly, the amount of food that you feed your horse should be directly proportional to how much energy he or she is using up. If you give them too little food, their energy levels will flag, and this will inevitably affect their performance. On the other hand, if you feed them too much food, it leaves them open to developing digestive and circulatory problems. Secondly, small meals given on a regular basis are healthier than large meals dished out on an infrequent basis. Thirdly, it usually takes an hour for food to digest properly, so avoid encouraging your horse to work during this period. Lastly, the bulk (mostly hay) to concentrate ratio needs close observation. Bulk should constitute one-third and two-thirds of your horse's daily diet, with the rest coming from concentrate. Water should be readily available for your horse to drink too. 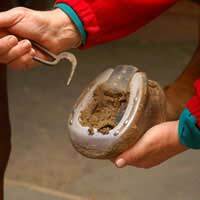 Shoeing protects your horse's hoof against wear and tear. It also protects against infection and disease. As the hoof can grow up to three-quarters of an inch each month, shoes need removing once a month so that the extra growth can be cut off. After this, the old shoes can be put on again if they're in good condition, or a new shoe can be fitted instead. You can check the general condition of your horse's hoof by running your fingers along the clinches (the folded over ends of the horseshoe nails on the outside of the hoof). This will either be rough or smooth. A rough clinch usually means a trip to the farrier is in order. Check the bottom of the hoof to make sure it's not grown over the shoe. Finally, check for any signs of thrush on the hoof. This will usually turn the hoof black and smelly. If you spot this, a farrier or vet will need to get rid of the infected skin and apply treatment as soon as possible. He or she will also give you something to apply to the hoof yourself as ongoing treatment. Caring for your horse requires considerable time and effort, but it's essential if you're going to keep him or her fit and healthy.